"Easy to make, flavorful and creates a wonderful aroma to come home to." Followed as recipe as it. Turned out very very dry. Nice recipe. 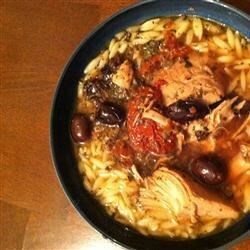 I added cup additional stock and served over orzo. Flavor was good, the turkey totally dried out. This would be better if it wasn't slow cooked.